The simple button is really simple. An example of a simple button is the Increase Font Size button in the Font group of the Home tab. Some simple buttons do its job immediately; others may pop-up a dialog box so that you can enter additional information. If you click on a Toggle button, it changes its color. An example of a Toggle button is the Bold button in the Font group of the Home tab. 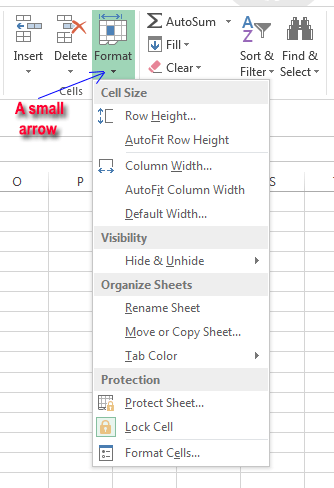 Say you want to make a cell’s data bold. To do this, make the cell active (just clicking on the cell), click the Bold command button and enter something in the cell from your keyboard. The entered data will be bold and the Bold button’s color will be changed. If you click again in Bold button, the data in the active cell will be normal again and the Bold button will be back to the previous color. You will find that some Ribbon commands have small down arrow, these commands are drop-down commands. If you click a drop-down command, other commands will appear below the drop-down. An example of a simple drop-down is the Format command in the Cells group of the Home tab. If you click on this drop-down command, other relevant commands will appear in the screen. A split button is made up of two parts: a one-click button and a drop-down button. If you click the button part, the command is executed. If you click the drop-down part(a down arrow), a list of other relevant commands will appear in the screen. An example of a Split button is Merge & Center in the Alignment group of Home tab. 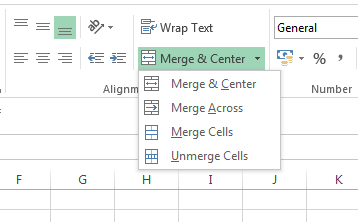 To merge and center the text of a cell, click the left part of this command. To get more commands related to Merges & Centers, click the arrow part of the button. Both type buttons have small arrows. When you take your mouse pointer over a simple drop-down button, the whole button will change color. Split button has two parts. If you take your mouse pointer over the left part, left part will change color, arrow part will not change. Selecting arrow part will change the color of the whole command button and display relevant commands in the drop-down menu. A checkbox control turns something on or off. An example is the Headings command in the Show group of the View tab. 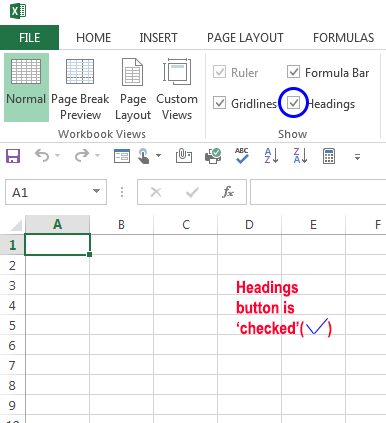 When the Headings check box is checked, the sheet displays Headings (Column letters & Row numbers). When the control isn’t checked, the headings don’t appear. 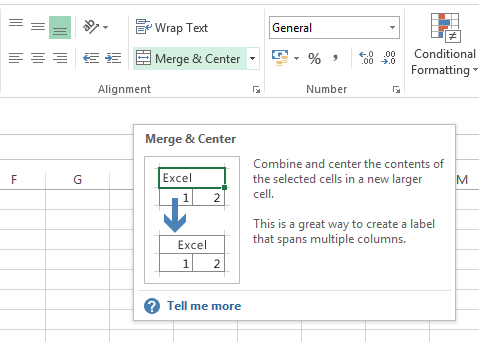 There is only one Spinner button in the Excel Ribbon. 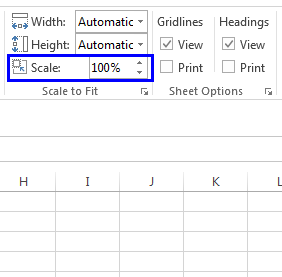 It is Scale in the Scale to Fit group of Page Layout tab. If you click the top part of the spinner, the value will increase and clicking bottom part will decrease the value. Some Ribbon groups contain a small icon in the bottom-right corner. It is known as dialog box launcher. For example, Home tab has dialog box launchers for the Clipboard, Font, Alignment, and Number groups — but not the Styles, Cells, and Editing groups. 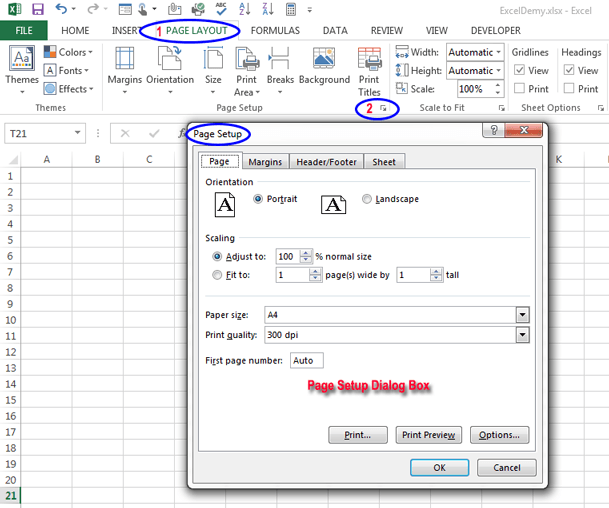 If you click the icon, Excel will display a dialog box with commands relevant to group.